A look at my place and you know I love baking. Though I cook out of necessity I bake as I love baking, the challenge it represents! Since I do not follow instructions, even with the blessed recipe lying in front of me, I manage to skip steps. If I try and memorise the recipe, I cannot. I lay out all the ingredients in front of me in the order it is needed but manage to forget something important!! So baking a challenge as tall as the Mount Everest for me. My earliest recollections about baking are beating sugar and “benni”, unsalted homemade butter in a big bowl with a ladle. The edges of the ladle hurt for I used to beat continuously for 15-20 minutes. Then the charge of beating it went to my sister who did it for another 15-20 minutes... hard muscle work but the thought of the cake kept us going and try and beat longer and better that the other. After all this you may be surprised that I have never guest hosted a bake event. Well that is to change now for the ever popular Bake Fest is to be guest hosted by me this September! Do check out the rules and send me many entries. 4. 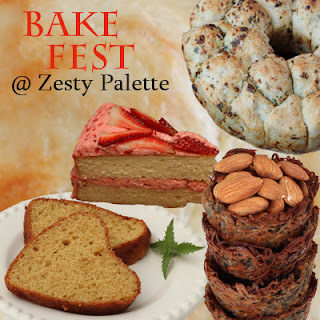 Link toVardhini's Bake Fest announcement and this page is mandatory. If sending an old entry, it needs to be re-published with the links. Happy hosting and thanks for hosting Archana. yep.. some baking happening this month will definitely participate! Enjoy and Happy Hosting !! I've sent you my entry. Happy Hosting, I have linked my Almond Biscotti for this event. And I am not able to see the Linked entries, is there any problem with it? Happy Hosting and Gud Luck! I am taking Part Yea! linked my second entry, orange loaf cake! New to blog Happy Hosting..!! i have submitted my Golden yellow cake.Waiting for ur reply. Could you please add this link to the collection. I posted this yesterday, but forgot to link.